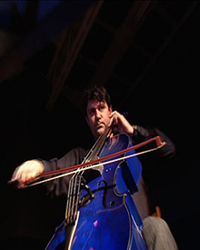 Spanning all areas of performance, Nicholas enjoys being a versatile cellist of the 21st Century. At the unusually young age of 16, Nicholas won a scholarship to the Royal Academy of Music to study under Florence Hooton, Derek Simpson, Douglas Cummings and Lynn Harrell. After concluding his studies there with many prizes and a first, he subsequently achieved first prize at the coveted Jacqueline du Pre Award from The Royal Society of the Arts. With kind support from various trusts, he continued lessons under Aldo Parisot and Janos Starker. During this time he was also a finalist in an international cello competition. At the age of 19, Nick became principal cellist in the Italian Toscanini orchestra where he remained for a year before moving on to tour the world as principal cellist and soloist of the Heidelberg Kammer Orchestra. Nicholas is a keen chamber musician having recorded flute quartets for the EMI label (BMV, Holland) and having been a member of the English String Quartet for six years, notably participating at their London Festival of Chamber Music – a regular feature of the classical music scene in London every autumn. Nicholas is currently a member of the ‘Balanescu Quartet’ who tour the world, performing in such venues as Sydney Opera House, La Scala (Milan), QEH & Festival Hall (England) and more popular music venues including Paradiso Club (Amsterdam) and the Electric Picnic (Ireland). The quartet has had much critical acclaim for their latest folk/classical album entitled ‘Maria T’ on the EMI label. The group have also recorded eleven albums under Decca and Mute labels. Their collaborations have included performances and recordings with Rabi Abu Khalil, David Byrne, Spiritulized, Petshop Boys, and Kraftwerk. Nicholas regularly records albums, films from ‘The Mission’ to ‘Harry Potter’, BBC Idents and TV dramas including being soloist for the recent period dramas, ‘Emma’ and ‘Wuthering Heights’. Nicholas began work with Tim Arnold on Sonnet 155 in 2007 and is responsible for all cello recordings throughout the album.